It's hard to come up with gift ideas for the youngest of 4, but my baby is outgrowing babydom and his hooded infant towels as well. 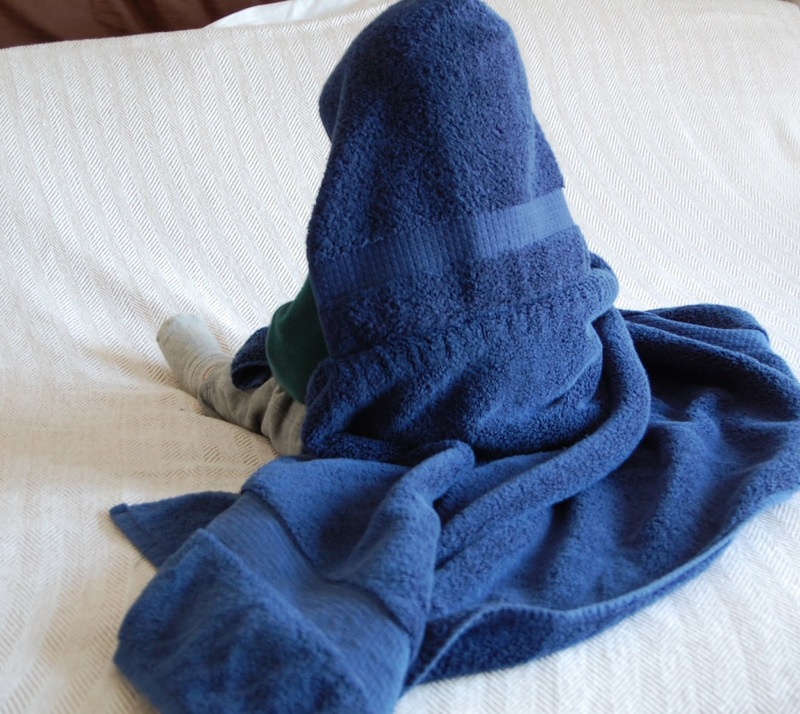 I love the convenience of hooded towels, which make it so easy to scoop a little one out of a bath and quickly envelope them head to toe in warm coziness, and so I decided to make him some larger towels. This project used two full size bath towels and one matching hand towel, split in half and rounded off, to form the hoods. The center point of the hood was then matched to the center point of the bath towel, and attached, hems enclosed in bias tape, with a few rows of stitching. If you don't have or don't want to use bias tape, this tutorial skips it. Either way, it's a fast project that's easy to customize and embellish as desired. became twelve puffy segments, which were then joined in groups of three to form a ball. This was one of the more tedious projects I've tackled (mostly because of the hand sewing, which I'm not very good at), but we do love the squishy and easy-to-grasp end result. I found this tutorial at Little Red Farm particularly helpful for making the puzzle ball. My oldest daughter is a voracious reader and has the top bunk in the girls' room, so she has been in need of an arms-reach storage solution for her books. I looked at various bunk shelves and bags, but ultimately wasn't happy with the options commercially available and decided to make my own. I used natural cotton bull denim, heavyweight interfacing, and a decorative calico she picked out for this project. I referenced this tutorial, but made the pockets to my own dimensions and created tie attachments to wrap around the bed frame. The main pocket can hold a large, thick book or two, and the two front pockets are just the right size for paperback novels or small items that are nice to have within reach (a flashlight is shown for the purposes of the above photo). She's actually been using this since her birthday earlier in December and it seems to be working well. My biggest Christmas project was for my younger daughter who loves dollies. She specifically requested a new "baby doll" for Christmas, and we settled on a 20" Lots to Cuddle Babies doll. It has a sweet face and a soft body, and because it's the size of an actual newborn it can wear regular baby clothes. To increase play options I made her a dolly diaper bag, dolly cloth diapers, and a changing mat sized for the new doll. I'm breathing a sigh of relief to have it all done. My long term project is to finish 5 more stockings in time for next Christmas. I've aspired to make coordinating stockings for our family for years, but only found time to make one (for my youngest) this year, in between some of these other projects. The fabrics are all prepped and ready, so here's hoping I can show you the set next December!